If you want to know who I am, don't ask me where I live and what I do, but rather ask me what I am living for and ask me in very small particulars why I am doing so little about it. The gift given to us comes struggling to escape from the tinsel and wrapping that disguises its coming and is the gift of Hope. It comes simply, in the form of a child, born into stark poverty, without a glimmer of material excess. Here is the very heart of the Christian faith: not a threat, but an invitation. God coming to us as a baby to do for us that which we could not do for ourselves. Offering us his very life of love and justice. The sign of Christmas is a star, a light in darkness. See it not outside of yourself, but shining in the Heaven within, and accept it as the sign the time of Christ has come. The 12-wheeler roaring over that rise bears down on a scattering herd of reindeer. Do you think it's pretty certain the heavy piece of equipment on it hardly is intended for improvement of life in the Sami culture that depends on those animals? Or are these Santa's reindeer stampeding away from commercialization? But wait, those reindeer and the truck are headed straight for me, standing in the way with a camera in hand! The whole image struck me as particularly appropriate to how I feel about the approach of Christmas this year. "Christ is born" replaced by borne down upon: not good. Let me see what I can do to lift the heavy load. Dana wanted me to write one of those newsy inserts you get these days in Christmas cards. I wish I could say I seize eagerly upon each one that tumbles from a card. I realize they're a good way to catch up with distant friends and relatives, and the years do speed by. Who has time to handwrite the same news in the cards we send out? We should write a personal greeting...but we don't. We used to...but not anymore. Garrison Keillor gave us a sample in a column last week of the kind of Christmas newsletter that somehow does not spread the cheer around. "Tara was top scorer on the Lady Cougars soccer team and won the lead role in the college production of 'Antigone,' which by the way they are performing in the original Greek. Her essay on chaos theory as an investment strategy will be in the next issue of Fortune magazine, the same week she'll appear as a model in Vogue. How she does what she does and still makes Phi Beta Kappa is a wonderment to us all. And, yes, she is still volunteering at the homeless shelter." [link] How wonderful for Tara and her parents, those cousins who always were more fortunate than we were...and still are. I read Garrison and knew a Christmas newsletter wasn't in my future this year. Not that our Ilona hasn't had an overwhelmingly stupendous year! And son Jeroch too, but it's just not that kind of Christmas this year...not yet. Both Dana and I have been late in getting preparations started this year. I think our concern and involvement with midterm elections here are factors. In the final weeks Dana was out almost every evening, organizing and helping campaigns. As December rolled around we had a house full of chores to do. They're not finished yet, but we've got to get cards and presents ready. The pressure is on and in years past that kind of excitement has inspired a certain kind of Christmas joy. But I seem to yearn for quiet contemplation this time. Dana's Spirit must have kicked in because she's preparing her fruitcake. Yes, I actually married a woman who makes fruitcake every year. It's another of those little secrets you discover well into a marriage, when it's too late to do anything about it. This year she will celebrate the Danish side of her heritage with Lys Frugtkage. Mmmm, there's the recipe on the kitchen counter. I look for the prunes. There must be prunes. The Danes put prunes in everything. Meat, potatoes, salad, bread...always the prunes. No wonder Hamlet was melancholy. But there are no prunes listed in the ingredients. What's with these people? Fruitcake seems the perfect chance for prunes! We'll have a Scandanavian feast on Christmas Day. Dana has invited relatives from all around, so there'll be plenty of Danes, but Norwegians and us Swedes too. Dana's Hungarian mother will just have to put up with us. Oh, we all were born in the States but over the years, we've tried to learn the traditions of the old countries to add to our combination families. My birth family was Swedish on both sides, but mostly we celebrated the Christmas of middle America. That means, as for so many of us, Jean Shepherd's Christmas Story spoke for me too. No one was a greater fan of Red Ryder and Little Beaver on the radio, but I was so far from ever hoping for a BB gun that I never even asked. But there, I've said it all and poured it out. I hope you don't feel worse but I do feel better. The day is about to dawn and I think the cards actually will get sent out and presents wrapped. There's no newsletter this year, but I couldn't improve anyway on the one with which Garrison concludes the column referred to up above. I'll water the tree and begin to get busy. A flickering ember of the star within is beginning to glow. 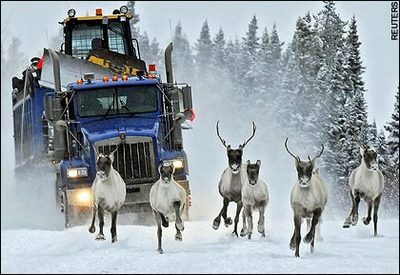 Those reindeer in the photo are just about to surprise that truck driver when they lift off and fly away! we had our first snowfall yesterday, on the Winter Solstice, which is way later than usual. It is hard to get into the "spirit of Christmas" because Christmas in Minnesota always includes snow. Instead it has been very brown and the lawn is still filled with dried leaves. Yes, we should have raked them by now, but we haven't. I walked up my sidewalk a few days ago thinking this must be fall instead of winter. I have gotten really turned off with Christmas, not in a depressing way. I am really neutral about it. I don't like the focus on material things that starts the second after Halloween is over and barrels down on us like the snow plow after raindeer. I also feel that everyday should be a special day, not just one day a year. Wouldn't it be nice if we were loving, and joyful all of the time and our presence would be a present. Last year my daughter started a tradition that is happening again this year. (She is the one who built a Christmas tree a couple of years ago out of things she found in the dumpster behind the flower shop) So on Christmas day we celebrate Pizza Day, and everyone gathers at her house for homemade pizza and good cheer. I always love your Christmas stories. Thanks for taking the time to put it into words. Well, we're entering year seven of the new millennium, and look where we are? A mere eight years ago some of us thought things would change for the better. There was a sense of optimism in the air: at least there was where I was, in the San Francisco Bay Area. After all, we, the human family, had made so much progress since our beginnings. But look at the twentieth century, the bloodiest on record. The other day someone mentioned a hundred million people were killed in war over that century. Somehow, that seems conservative. But whatever the true figure is, which is unknowable, the insane blood purge was enormous. Could anyone shatter our dreams worse than George Bush? We all knew he would be quite bad, indeed awful, terrible. But he has turned out to be even worse than many of us expected. I at least never anticipated this war: that he would stoop so low with his lies to mislead the American people into the war. Though when it began to approach (George wouldn’t take “yes” for an answer) in the summer of 2002 I and many others became alarmed. And were appalled by what was approaching. For there were millions of us then who saw through the lies and charade. So we're off to a new start. No wonder there is so much gloomy misgiving in the air. We have no worthy leadership in Washington. So at the start of this new millennium many of us, including myself, have become conservative, longing for the bad old times. For example: at least we have no extermination camps in the US. And we, the American people, felt pretty good about eliminating them in Europe in the 1940s. But now here comes Bush, putting his foot into that door, reminding us that human nature hasn’t changed.... It's not a pleasant feeling. Perhaps we grew too big for our britches and complacent and willing to believe mountebanks and cynical manipulators. We are now very much into the twenty first century. And we still have a long way to go. A Christmas tree made out of junk in a dumpster? Pizza? I feel badly I didn't update this entry...especially since in the meantime dear Swan has announced at her own Log she is quitting the site. I wept my tears at her departure over there. I just want to say the Season had its way with me at last, that people started showing up here, there, and everywhere...and we still are at it, leaving in a few minutes for my hometown in Western New York. There will be joy galore up there...though no snow! We'll be at Blue Rock Station http://www.bluerockstation.com with our friends the Warmkes (and where Ilona is already) for New Year's Eve. AND most important, the fruitcake turned out wonderfully! I can't get enough of it. Hmmm, do you think all that brandy has anything to do with it?